Tart, sweet, and with a hint of caramel and almonds, my 3 Ingredient Cherry Amaretto Limeade is the perfect way to start your weekend. Or even your week! Mix the amaretto, cherry juice, and limeade together. Add ice to your glass. Pour the cherry amaretto limeade mixture over the ice. Garnish with fresh cherries or lime wedges. 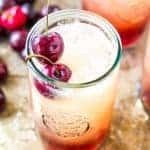 *For a large batch recipe combine 16 ounces of amaretto, 8 ounces of cherry juice, and 40 ounces of limeade. Stir to combine and chill until ready!